Hi everyone!! How are you doing? Well first of all. A very Merry Christmas to you. I know I am two days late, but still. I wish you all the best! I had a little break from my manis and all the polish stuff. I even had naked nails for one day. I thought I was doing them a favour. But instead three of them chipped :(. The middle finger on my left hand and two fingers on my right hand. I have very brittle nails and without the usual four layers of polish they are pretty thin. Well, lesson learnt. I will never leave them barefoot again :). And what was I doing during these days? Me and my husband made a special dinner for the four of us. My eldest daughter was very excited and was talking like ‘Uuuu, what a great dinner! I love it! I am so excited!’. And she was saying these word through the entire dinner :)). It was really great to see how happy she was. The youngest was a little too young to even know the difference between an ordinary evening and that evening. On the Christmas Day we went downstairs to my parents. My mum made a lunch and my sister came over for a visit. And yesterday my husband’s nephew had his birthday so we went there to congratulate him. Well and of course to bring him a gift. And now enough of my chit chat. I heard that snow is coming to our place (finally!) so I decided to go with something snowy. 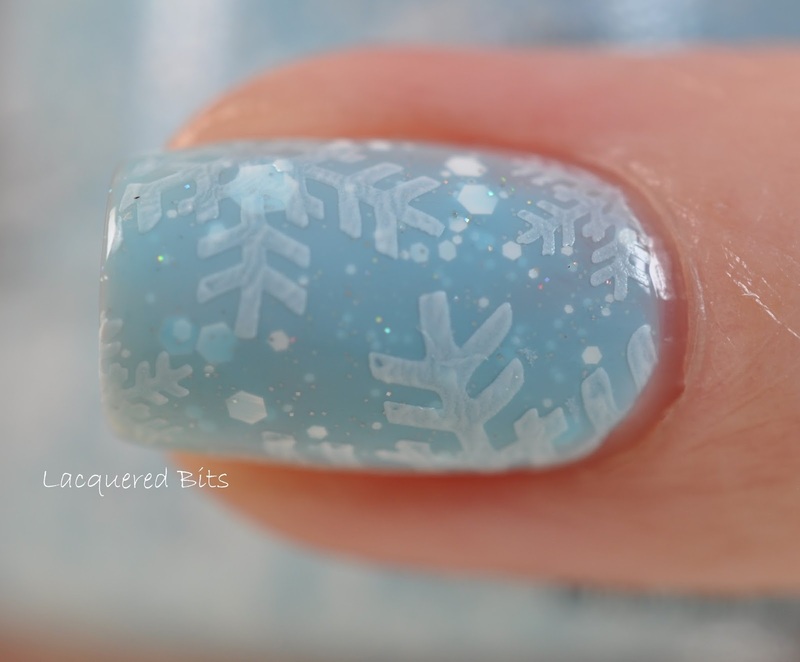 I used KBShimmer – Snow Way!. 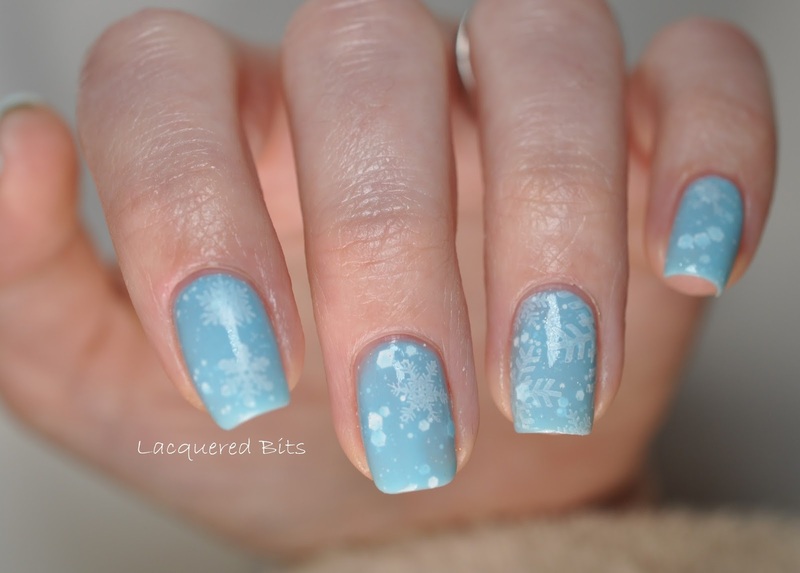 It is a gorgeous light blue polish filled with white hex glitter of all sizes. And I think there is a little shimmer added. Beautiful! It was easy to apply. I put on two coats but maybe I should have done three cause it was a little sheer. And it had a jelly finish. You can see the shimmer in this macro shot. 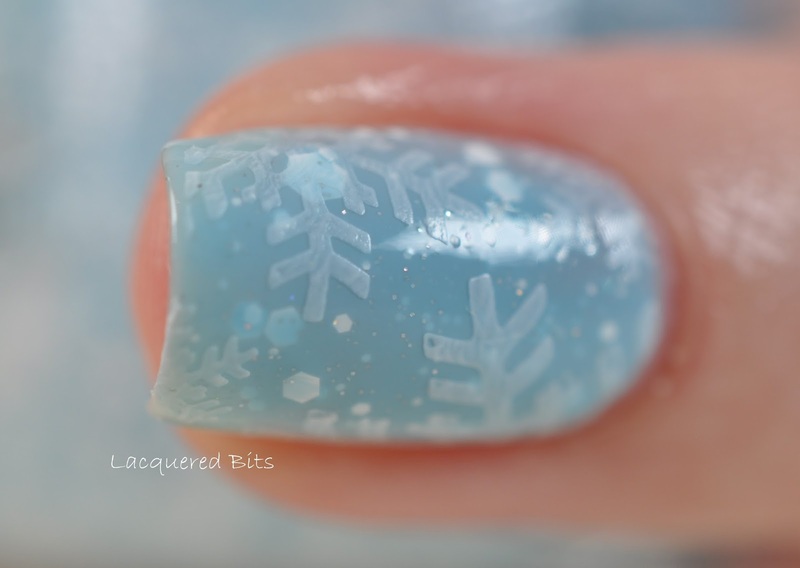 For the snowflakes I did a little stamping. 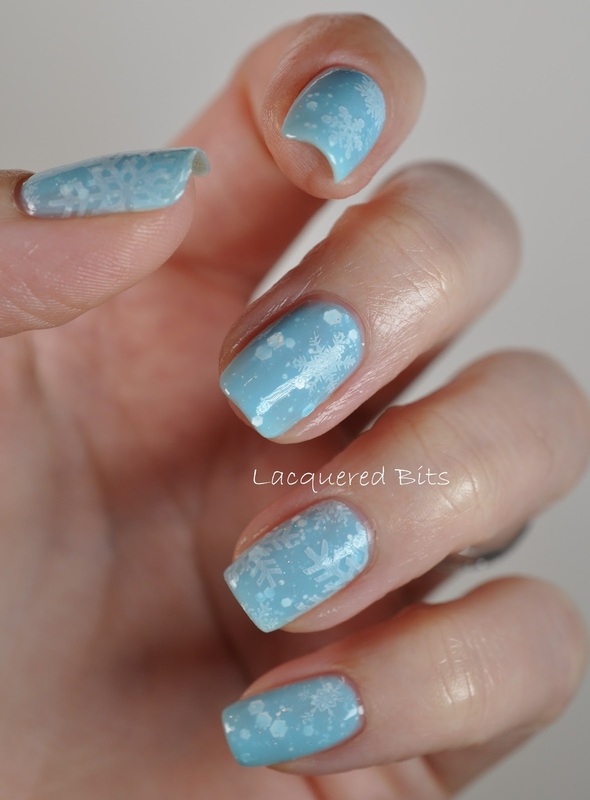 I used two different plates from MoYou London’s Festive Collection, No. 2 and No. 3. The white polish I used was Essie – Blanc. All in all I love the outcome. To be honest I didn’t think it was gonna look this great on nails. And I think this colour really complements my skin tone.